We find ourselves in a time where the need for radical transformations across industries and regions has never been this urgent. Most countries have even agreed on the shared pillars on which a sustainable world should be build, namely the Sustainable Development Goals (SDGs). These common goals are increasingly referred to and fortunately implemented. Everyone who nowadays works in an environment that is somehow occupied with sustainability or long-term growth, has seen a presentation slide or report where at least one of the SDGs has passed by. On the one hand, awareness- and knowledge levels around the SDGs are growing. On the other, it feels incredibly difficult to prioritise and measure our impact. Both for companies and governments, as well as for each individual. In September 2018, a new initiative has even been launched, called the Good Life Goals. It’s a new effort to translate the Sustainable Development Goals in understandable and reachable goals for every individual. Shaped through a multi-stakeholder collaboration (by e.g. Futerra, the 10 YFP Sustainable Lifestyles and Education program, SEI, IGES, UN Environment, UNESCO, WBCSD), the Good Life Goals consist of 85 simple actions people can take in their every day lives. Every year since the launch of the 17 Sustainable Development Goals by the United Nations General Assembly in 2015, an annual report has also been launched to analyse each country’s actual performance and progress one each SDG. The report SDG Index and Dashboards Report is a joint initiative by the Bertelsmann Stiftung and the Sustainable Development Solutions Network (SDSN). An interesting side note is that all results are based on solely publicly available data in G20 countries. 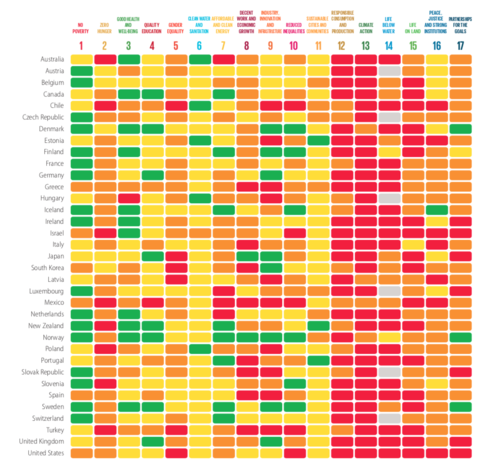 It provides an in-depth overview of where countries are lacking or leading, with a specific focus on the status of each SDG. The report could be perceived as a much needed reality-check and a global to-do list. This shows that the efforts of all actors in these countries should ideally be focusing on achieving these goals. From a brand’s perspective, it’s also becoming essential to integrate the SDGs in strategy and operations. Sustainable Brand Index™ is the largest brand study on sustainability within The Nordics and The Netherlands, both conducted within B2C and B2B markets. Each year the perception of consumers and decision-makers on brands and the SDGs are measured. In Sustainable Brand Index™ the SDGs also play a key role in the methodology; both in the definition of sustainability, as well as in specific survey questions. Which SDGs do consumers and decision-makers think are most important for brands to prioritise today? When comparing the official results of Sustainable Brand Index™ 2018 with the data from the SDG Index and Dashboards, we can see an interesting overlap. In Sustainable Brand Index™ 2018, Nordic consumers (Sweden, Norway, Denmark & Finland) believe that SDG 12 - Responsible Consumption & Production, is the number 1 most important goal for companies to prioritise today. SDG 13 - Climate Action often comes in as the second most important goal to address within the B2C sector. In The Netherlands both SDG 12 and 13 are also in the top 3 of most important goals to prioritise by companies. These goals are both in the red zone of the SDG Index and Dashboards Report 2018. On November 29th, the 2018 official results of Sustainable Brand Index™ B2B will be launched in Sweden. The launch of the B2B edition in an important step in mapping the perception of even more stakeholders across markets. The SDGs play a similar role in the methodology of the B2B study. The purpose of Sustainable Brand Index™ B2B is again to push the sustainability agenda forward and to measure which SDGs need to be prioritised by B2B brands. Curious to know which SDGs are perceived as most important within the B2B market this year? Stay informed on the results here. By measuring the perception of important stakeholders across markets, we can show the gap between what brands are doing, how they are perceived by their stakeholders and what is expected from them in order the be considered sustainable. In a nutshell, the SDGs are spreading; and this is a good thing. However, it is becoming increasingly important to measure our performance and perception to also understand the gaps between how we think things are and the reality. The SDG Index and Dashboards Report is one of the crucial studies that helps us understand these gaps. It visualises extremely well on which SDGs we are performing relatively good and which goals we need to prioritise to really make an impact. The aim is to move away from the red and into the green, while time is running out. Measuring performance and perception assists all actors in understanding and prioritising their impact. At the same time, it can accelerate collaboration and partnership between actors and regions. In the end, we seem to have more common challenges than separate ones. That being said, SDG 12 - Sustainable Consumption & Production and SGD 13 - Climate Action needs to be on everyone agenda today. From decision-makers to the individual consumer. Bertelsmann Stiftung and Sustainable Development Solutions Network, (2018), SDG Index and Dashboards Report 2018, Global Responsibilities, Implementing The Goals. Also check out the report Bumps on the Road to 2030: An overview of the common challenges for the Nordic countries in achieving the Sustainable Development Goals (SDGs). The report is created by Nordic Sustainability, commissioned by The Council of the Baltic Sea States (CBSS) and the Nordic Council of Ministers (NCM). Nordic Sustainability is a Copenhagen-based consultancy with deep knowledge about the Nordic perspective on sustainability.